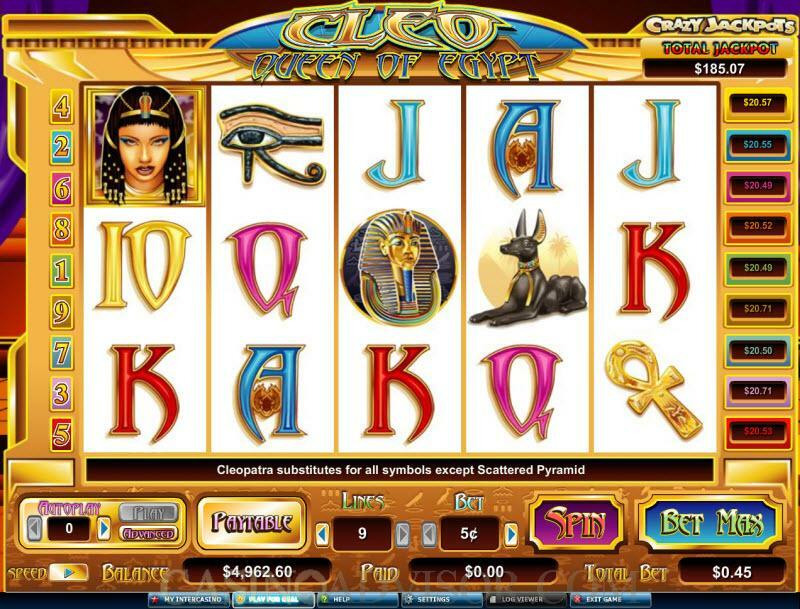 One of the newest online slot machine games to come out of industry leader Cryptologic’s stable is Cleo Queen of Egypt. This game is full of excellent features, and has been labelled by Cryptologic is ‘the world’s first nine jackpot video game’. The theme here is, of course, Egyptian, and the animation of the game, which is outstanding, makes for a rich player experience and some amazing slots action. Cleo Queen of Egypt, which was released on July 30, 2009, is available at casinos such as Intercasino, Littlewoods Casino, VIP Casino, Sky Vegas Casino, DTD Casino and Casino Joy. However, players from the United States are not allowed here. Powered by Cryptologic’s top of the line online gaming software, Cleo Queen of Egypt is a pleasure to play. Both manual and auto play options are available - the auto play function will cease to operate when a big win or a bonus round happens. Cleo Queen of Egypt slots game is full of excellent features that make the game experience one that a slots fan would be eager to repeat. There is an exciting bonus game feature, an auto play function and wild and scatter symbols that add to a player’s winnings. Cleo Queen of Egypt is unique in that it has an incredible nine jackpots to be won. Each of these nine jackpots can win a player up to $2000, substantial winnings by any standards. This is one of the reasons that the Cleo Queen of Egypt slots game is so popular with slots enthusiasts, particularly in Europe. In Cleo Queen of Egypt, the minimum coin size is $0.05 and the maximum coin size is $5. The wild symbol in Cleo Queen of Egypt is the Cleopatra icon. This symbol can win you a lot of money. There are nine possible win lines in the Cleo Queen of Egypt slots game, each of which carries its own progressive jackpot prize. This jackpot is won when a player gets five wild Cleopatra icons on a specific pay line. The enjoyable, rewarding bonus game is one where you have to choose a particular prize. Multipliers are applicable here, adding to the winnings you can earn in this game. The Pyramid is the scatter icon in this game. 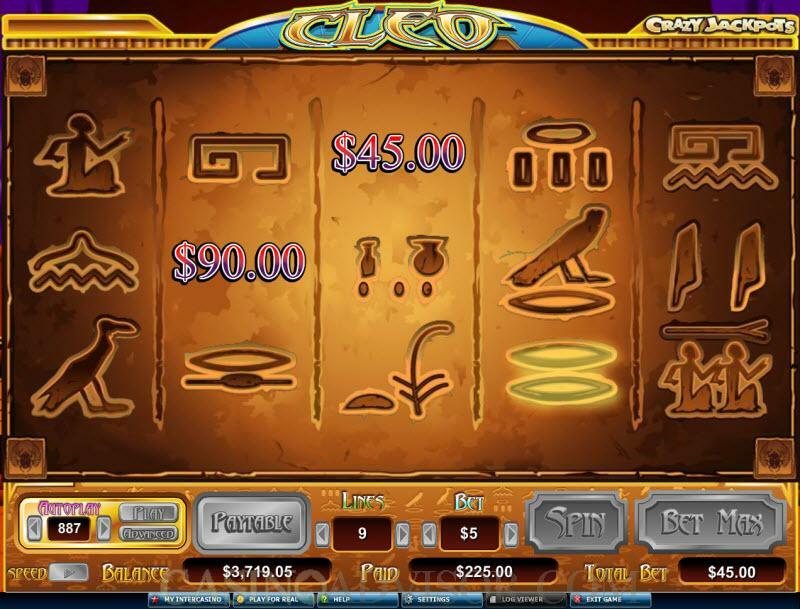 The bonus game in Cleo Queen of Egypt is triggered when a player gets a minimum of three Pyramid scatter symbols among the reels. Bonus rewards can be won here, and you can pick a prize as well as multipliers in the bonus feature game, the Trapped Pick a Prize bonus feature. This game can be very profitable, if your luck is in. The game ends when you reveal a trap icon while choosing rewards. This is a great game to play for fun as well as profit. Cryptologic has maintained its high software standards, with the result that we have yet another wonderful game to add to the many others from this leading online gaming software provider. 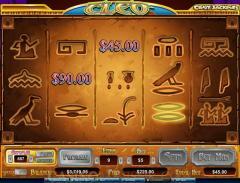 Get on to the reels in ancient Egypt and get winning - Cleo Queen of Egypt awaits! Interested in reading more detailed information about Cleo Queen of Egypt? If so Click Here for more details.